Board Members in attendance were: Rob Frits, Judy Hammond, Nancy Brown, Glenn Jones, Jerry Martin, Rob Stark, Ralph Gresham, Tommy Hensen, and Hope Feiner. Also in attendance was: Tom Jefcoat, ARC. The meeting was called to order at 6:30 p.m. by President, Rob Frits..
George Kelly stated the trees are his main concern. He hopes the board will keep in mind that some residents just will not maintain or replace their dead trees. This could result in filing liens against the property and that may lead to more problems in the future. Scott McDaris family had a large fireworks shell set off by an unknown person in the neighborhood land on their car causing $700 worth of damage. All the board can do is send email reminders asking residents not to set off fireworks. Officer Scott with the Springdale PD was present and added that they did try to do rounds during the holiday, but the police department had 500-600 calls around the 4th of July. Robert Frits asked Officer Scott to pass along our concern to the chief of police. Secretary: Jerry Martin nominated Nancy Brown for Secretary, seconded by Rob Stark. With no further nominations, the vote was 9 ‘for’ and ‘0’ against. Vice-President: Judy Hammond nominated Rob Stark for Vice-President, seconded by Jerry Martin. With no further nominations, the vote was 9 ‘for’ and ‘0’ against. President: Jerry Martin nominated Rob Frits for President, seconded by Judy Hammond. With no further nominations, the vote was 9 ‘for’ and ‘0’ against. New Business: communication/website improvements presented by Rob Stark. Rob stated he has the controls set and feels we can do better than the current website which is not user friendly. He previously sent the following email for review by board members prior to the meeting. I would like to suggest we run our own email server or find someone who provides email services for our domain. I will make some suggestions here and can come up with some numbers for this. One of the things that bothers me for some reason is constantly trying to remember to included everyone on the board in an email when I communicate. I realized that some people have software that can contains groups. But I think we need to have a group email that can be controlled via our side and not individually. For instance sending an email to poa@harbermeadows.org should forward a message to all board members. There are numerous reasons why this would make us more efficient as an organization, and I would like to discuss this at the meeting. Additionally, I think it would be nice that board members not have to give out their personal email. For instance, we could have an email address president@harbermeadows.org be a published email address that gets forwarded on to whomever the current president’s address is. These email addresses could be published on the website and these addresses would never change. This would be easier for the residents to handle and in our communications with the public, we can keep these addresses the same always as they are static addresses which will point to non static private addresses. The second issue I would like to address is our domain name. In researching some of this stuff, I stumbled upon the fact that we don’t legally own our domain name harbermeadows.org. AtHomeNet, Inc. actually owns the name. This is could be big problem for down the road for many reasons. I have attached what is called a “whois” record. In this record, the “Registrant” is the legal owner. In our case AtHomeNet, Inc is the registrant. The way it should be is that we are the registrant, and we give ATHomeNet, Inc. permission to modify our DNS record by making them Admin or Technical contact. If you notice AtHomeNet has all three roles under their name. I would like to discuss some of our options about dealing with this at the meeting. Secretary’s Report: presented by Nancy Brown. The minutes from June 2013 were previously emailed to each board member for their review prior to tonight’s meeting. 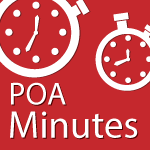 Judy Hammond moved, seconded by Jerry Martin to approve the POA minutes for June 2013. The motion passed 9-0. Treasurer’s Report: since Alicia was not at the meeting, she sent the following email to board members, along with the financial report to board members for their review. I have attached the updated June financial reports. All Around Contract – includes the remaining balance from January when they used the old rate to invoice the POA. They invoiced the previous year’s rate and just realized it a couple of weeks ago. Yes – we owed it. The extra insurance expense is the insurance that was paid for the POA’s portion of the fireworks show. The amount was $364 but Mike Luttrell says he intends to donate his commission to offset some of the cost. The increase in maintenance is from the additional Scott’s Lawn Service. Also, we paid Dale Creamer $877.29 for watering trees during the month of June. The miscellaneous amount includes the $5000 for fireworks and $40 for lien releases on 2 properties. I will reclass that $40 in July since it should fall under office expense. June was the first month for pool payroll. The pool attendants make min wage of $7.25 per hour and Jill Smithson (pool manager) is paid $1,000 for the months of June, July, August and September. The electric bills are rather low for the month but they have changed the number of days they billed for in the cycle. I have made 2 changes since I sent the report to the finance committee. The changes were the water bill and the Krystal Klear invoice. Those came in after the earlier reports so I have updated the amounts on this report. (Some contract amounts have changed due to the sales tax increase – such as Krystal Klear). Jerry Martin moved, seconded by Ralph Gresham to approve the June 2013 financials. The motion passed 9-0. Property Manager’s Report: since John was not at the meeting, he sent the following email to board member for their review. The northern walk bridge has been sanded, primed, and painted. There is one area that appears to have been missed underneath the bridge. I have notified CertaPro. Work on the southern walk bridge has begun. This should be complete any day.  The bridges on Founder’s Park and Coyote Crossing are on the list to be painted by the City.  Warren Wheat lives in Har-Ber Meadows and owns his own commercial construction company. He and I have met and inspected the affected areas. He took his brick mason by each location the week of 7/15. He will send me his proposal to fix the areas along with a bid as soon as the brick mason completes his assessment.  Two trees were damaged a car accident several months ago. The insurance company of the resident has paid the claim to remove/replace the trees in the amount of $1,000. Methal-Anthranslate chemical that is sprayed on the grass. Rejex-it Goose Repellant: Each container covers up to 16,000sf. It lasts 3-4 mowings. All Around recommends applying it thicker the first round (14,000 sf coverage per container). The cost is $107.99 per container plus tax and can be delivered in 6 days. Labor will be a separate charge. Ralph added that the residents need to stop feeding the geese. Ralph Gresham moved seconded by Judy Hammond to purchase one application of Rejex-it Goose Repellant and have it applied around the pool area. If it works, then we could purchase additional applications. The motion passed 9-0. I have McCutheon Welding looking in to solutions that would prevent entry from the bottom of the fence by adding more bars on the lower section.  Television Discussion – Rob Stark moved, seconded by Jerry martin to approve up to $1000.00 for the purchase of a television to be installed. The motion passed 9-0.  Carol Crumpacker is looking into a water feature for the area. She is interested in either a water feature or playground. She wants to first determine the cost of the water feature before suggesting a memorial to the Board.  Watering program continues to be successful for both sod and new trees in this area.  After inspection, there are 68 street trees that need to be replaced by residents. Sending letters to residents that need street tree replacements along with recommended tree species when we receive another supply of Har-Ber Meadows envelopes.  Waiting on Rodriguez Landscaping to start project. I solicited a backup bid from Certa Pro since he was slow to get started. Their bid was $2,500. I will continue to encourage Rodriguez to get started.  Waiting on Rodriguez Landscaping to start project. I will continue to encourage Rodriguez to get started. – If the bid is within his $450.00 limit, then John has the authority to start the project.  I have requested a new bid with materials that would cost $500 per sign instead of $750. Concert in Founder’s Park Discussion – music should end at 9:00 p.m.
iii. Sunday, August 11 – Judy Hammond moved, seconded by Nancy Brown to have the concert on Sunday, August 11, 2013. The motion passed 9-0.  I’m meeting with the band before I leave town 7/20 to make sure the power supply and location is sufficient for setup. We have also been notified of a public hearing at the Springdale Planning Commission on 8-6-13 for a commercial building proposed on 1.07 acres on Lynch’s Prairie that will be one story high and contain offices. Someone has been opening and closing water valves on the lake behind the pool resulting in water being diverted to the wrong lakes. This may have resulted in the lack of proper water levels and oxygen levels in Elizabeth Lake causing a fish kill of approximately 600-700 fish. All-Around helped clean up the fish. Ralph has a friend who manufactures fish habitats where small, developing fish can hide from larger ones. If we like, he would install them free . Ralph asked for permission to put a canoe in the lakes/ponds in order to check water depths. Judy Hammond moved, seconded by Glenn Jones to give Ralph permission for the canoe in the lakes/ponds. The motion passed 9-0. The lake clean-up workday was a tremendous success and will do it again. We would like to recognize and thank all the residents that donated their time and effort to work on the lake clean-up. Congratulations to Mike and Danielle Henderson, 6303 Tall Oaks Loop North, as Harber-Meadows Yard of the Month Winner! i.56th Street – letter sent to city and homes on 56th Street. iii Sidewalk responsibility – some areas of the sidewalks are raised. Rob Frits will get with city representatives to figure out whose responsibility it is. With no further business, the meeting was adjourned at 8:22 p.m..
Respectfully submitted this 26th day of August, 2013.